At the heart of any electrical control system is the control panel. We build high quality control panels at very competitive prices. Our attention to detail is impeccable, our design process is thorough and we strive to produce failsafe systems. We take pride in every panel we produce, regardless of size or complexity. We can supply control systems from simple relay control panels with push-buttons and lamps, through PLC based control panels with graphical human machine interfaces, to high end fully integrated office PC based shop-floor monitoring systems. 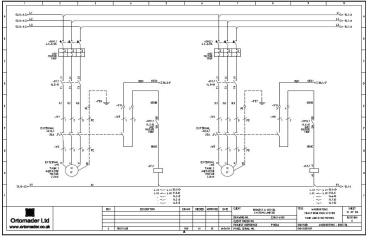 All of our control systems are accompanied by comprehensive electrical schematical drawings – drawn in Autocad Electrical or E-Plan. If we are not actually supplying the control panel for you, we also offer Autocad drawing and design services separately as required. The design process is critical in the formation of a successful control system. We do not underestimate the amount of time needed in the early stages of a project to ensure its success – we believe in the importance of regular site meetings and coherent communication at all stages. Our knowledge and experience of working with the oil and gas industry and the standards they demand, mean that we are able to produce high-end systems with the highest level of safety and quality. Our control systems are often installed in environments where there can be extreme variations in climate. We have the expertise in design to meet these extremes. Documentation and manuals can be provided to support our systems.